In a time when animal shelters are overflowing with unwanted 'pet' animals, this is just exactly what we need isn't it? A whole new craze in 'pets', complete with the endorsement of celebrities whose target audience is young children. "'They will sit on your lap while you watch TV so you can scratch their belly. They will even talk to you and have you giggling for hours." All of a sudden, pigs have made their way into the spotlight as the latest pet craze in the UK. Admittedly, these pigs are a little different to the pigs we're all familiar with. They're tiny pigs – Miniature Pot Bellied pigs crossed with other breeds to create tiny, colorful, "Micro Pigs" which are sold for between £195 and £700 ($300 and $1100 US). These pigs weigh a mere 9oz at birth, and are around the size of a tea cup. Two years later, when the pigs are fully grown, they stand at around 14 inches tall. As one would expect, in a society where small, friendly animals are generally viewed more as toys than sentient beings, these cute little commodities "are being snapped up by celebrities". And just to make doubly sure that, once they make it to the wider market, children will be sending their parents in force to the pet stores to bring home these living birthday gifts… the celebrities in question include Harry Potter actor Rupert Grint. Demand for micro pigs is soaring and we are inundated with inquiries every day," says Jane Croft, 42, who has given up her job to breed them full time. "It's amazing how popular they have suddenly become and just how many people want pigs as pets. Her company website has been getting 4,000 hits a week and she gets at least 60 emails and 40 phone calls a day from people all over the world, including America, Russia, Spain and even Australia. In a time when animal shelters are overflowing with unwanted 'pet' animals, this is just exactly what we need isn't it? A whole new craze in 'pets', complete with the endorsement of celebrities whose target audience is young children. 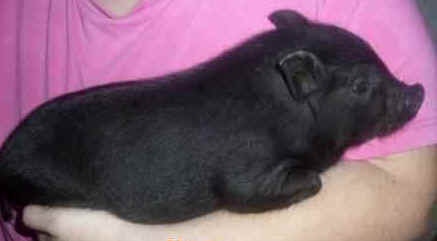 Sure, the price tag is high right now, but once Petland and their friends get wind of this idea, what's to stop them and others from selling miniature pigs by the thousands? In my estimation, before you know it, forums such as this one will be forwarding requests for homes for miniature pigs, alongside the endless stream of e-mails begging for mercy for dogs, cats and other animals who are living on death row, after committing no crime other than having worn out their welcome in a home where their novelty has worn off. Of course, it will come as no surprise to many animal advocates to hear that the pigs are reported to be clean, highly intelligent and very loving and affectionate. Well, hang on a minute. Isn't that what animal rights advocates have been saying for years? Pigs are intelligent, sociable, clean, wonderful animals who are loveable and affectionate, just like dogs… So, why is it that, unlike their canine counterparts, pigs are still generally considered 'food animals'? I can't help but wonder whether the owners of these miniature pigs eat pork products. One must assume that at least some of them do… Which begs the question, considering the generally accepted position that some animals are meant to be pets and some are meant to be food… how on earth do they reconcile that inconsistency? There is only one glimmer of hope that I can glean from this situation. I imagine that there are people who are, for the first time, going to have the opportunity to learn to love a pig, and who, sooner or later, will make the connection between the pig who sits on their lap and lets them tickle her tummy, and the pig who was butchered for the bacon on the breakfast table. Perhaps, in some bizarre irony, the manipulation and exploitation of these micro pigs will turn out to be the way that people learn to see pigs as they really are; not as bacon, or ham, or pork chops, or sausages, but as warm, intelligent, affectionate beings who, just like the family dog or cat, also have love in their hearts to give, and also have a will that burns inside them, driving them against all odds to survive, driving them against all odds to live.